Upping the thermostat, piling on layers, moving to Florida: humans have figured out many ways to manage the cold, including escaping from it entirely. A plant's options are limited. If you've ever looked out on your garden after a blizzard or an ice storm, worried how your plants were holding up, and felt the urge to do something, read on. Most plants don't need our help. They've evolved to handle the climate of an area and can take all but the most extreme weather events in stride. If they go into winter healthy, well watered, and not under stress, they should come out on the other side little worse for wear. The exception is if a plant is only marginally cold hardy in a zone: crape myrtles in the north, for example. Sometimes the above ground growth of these plants will die, but the plant will grow back again from the roots once the weather warms. Often it's not cold that does a plant in, but fluctuating temperatures: unusually balmy days and freezing nights. A run of unseasonably warm weather can trick some plants into believing it's time to push out new growth, which then gets killed by a hard frost. 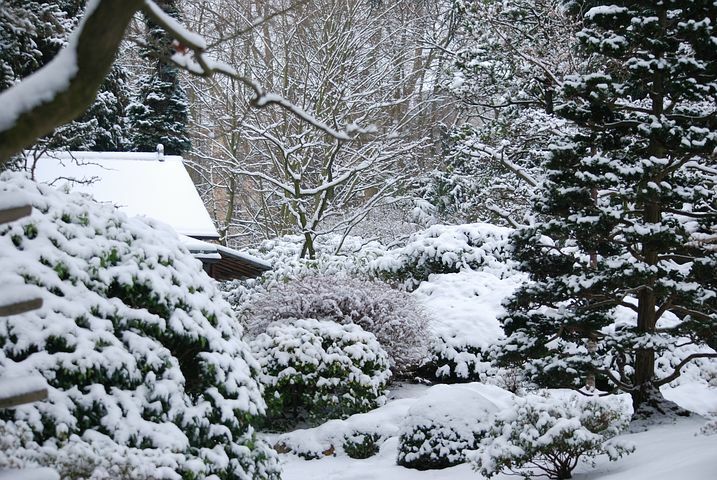 Here's what to know to keep plants healthy and protected through winter weather. Unlike humans, plants aren't affected by wind chill or "feels like" temperatures, but extreme cold can kill them if their roots freeze. A thick layer of mulch helps to prevent this. One group of plants that does visibly react to cold is rhododendrons. When temps fall below 35 degrees, the leaves begin to curl; below 25 degrees, they'll also droop. The reason is that broad-leaved evergreens continue to lose water from their leaves in winter. The curling is a defensive maneuver, it protects from cold, dry winds by reducing how much leaf surface is exposed. Once temperatures climb, the leaves unroll. What to do: Once the ground freezes, cover perennials, trees, and shrubs, rhododendrons included, with 3 to 4 inches of organic material. It can be wood chips, shredded leaves, pine needles or straw. Be sure plants are well-watered going into winter. When planting rhododendrons, site them where it's not too windy, and out of the afternoon sun. Spray-on anti-desiccants also help keep moisture in the leaves. When water in a plant's cells turns to ice, it can rupture cell walls, irreparably damaging that area and in extreme cases (think impatiens after a frost), killing them entirely. When plants go into winter dormancy, they reduce the water in their tissues to prevent this kind of damage. But a spell of warm winter weather can promote new growth, which is tender and vulnerable to frost damage when temps inevitably drop again. What to do: Prevention is best. Site vulnerable plants, such as those with flower buds that are susceptible to early spring frosts, on the east or north side of a building. Choose later-blooming varieties. Smaller plants can be covered overnight with a sheet or blanket if a deep frost follows a warm period. Snow can actually protect plants, especially perennials, insulating them from wind and fluctuating temperatures, and of course providing moisture when it melts. Evergreen branches are loose and springy for a reason; they bend, not break, under heavy snow. Snow buildup is more likely to damage upright evergreens such as arborvitae. And it's the lack of snow along with freezes and thaws that causes perennials to heave out of the soil. What to do: You can brush light snow off branches when it first falls, but once it hardens, don't try to knock it off. Wait for it to melt. Tie arborvitae and other upright evergreens' branches gently together with a soft, flexible material such as old pantyhose, which won't cut into the branches. For a plant that has heaved out of the soil: when the weather warms and the ground softens, gently replace the soil around the plant. If the roots were exposed for a long period of time, it may be too late to save it, but allow extra time in the spring to give it a chance to recover before giving up on it. For trees and shrubs, ice has the potential to do the most damage. The weight of ice can tear limbs from trees, snap trunks or topple them altogether. River birches, evergreens such as white pines, and arborvitaes are most susceptible to damage from an ice storm. What to do: This is one case where doing nothing is safest for you and the plant. Stay away from falling ice and allow it to naturally melt. Trying to remove it can break limbs and stems. Plants, trees included, usually bounce back to normal shape, perhaps not immediately, but by spring.